Use a Skid Steer as a Snow Mover! 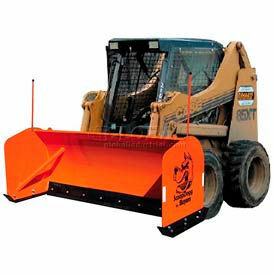 These snow pushers are specifically designed for use with skid steer loaders. Heavy 7 gauge precision-rolled steel moldboard enhances the rolling of snow. 5" x ¾" thick extreme-duty wear shoes are constructed from abrasion resistant AR400 steel for greater wear life. 8" x 1" premium rubber compound cutting edge for durability. Two 4" steel channel posts are welded to 5/16" thick steel side plates for exceptional strength. Universal quick-coupler attachment offers easy mounting to skid steer. Safety orange powder coat finish is scratch and corrosion resistant. Non-Returnable.